Location was perfect, smack in the middle. Walking distance to all the tourist areas. Rooms were clean and spacious, really good value for money. I would recommend this stay. Location is good near to my business and even the happening places. 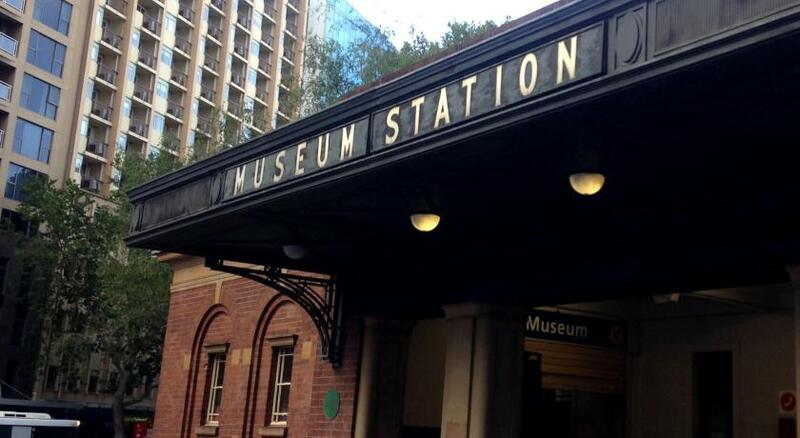 Conveniently located in the CBD of Sydney. The room was a good size and clean, the kitchenette was a bonus. unfortunately this was only an overnight business trip but will keep this hotel in mind for holidays. Staff was friendly and professional. Location was great and near the Museum train station. Location definitely makes it easier to travel in and out of airport. I love the beds and pillows! They were so comfortable. I never slept so well before. The location was close to the Museum Station so it was easy to use the rail way from and to the airport for a cheap price compared to taking a taxi. Thanks for the memorable stay. Terrible price for the food. $19.00 for breakfast was high. easy to find. clean and tidy. shower was also good. Location was great ,close walk to downtown ,train stations ,tourist places Hotel is clean ! The location was perfect. Near the train station easy walk to museum, park. The property was nice with well appointed room. Couldn’t ask for a better stay! 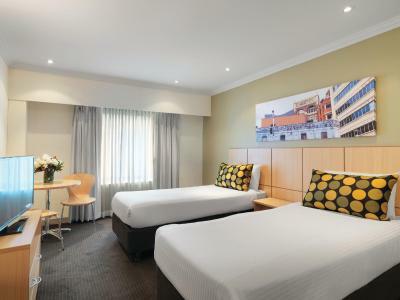 Travelodge Hotel Sydney This rating is a reflection of how the property compares to the industry standard when it comes to price, facilities and services available. It's based on a self-evaluation by the property. Use this rating to help choose your stay! 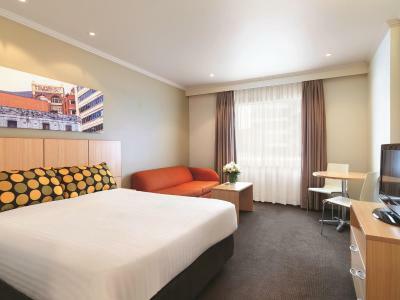 One of our top picks in Sydney.Travelodge Sydney offers self-contained accommodations just 2 minutes’ walk from Hyde Park and trendy Oxford Street. 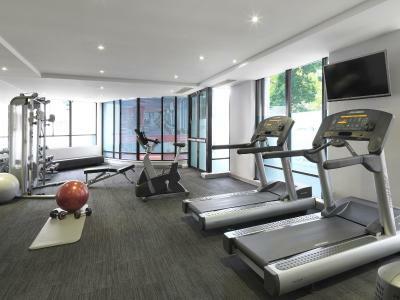 The property features a fitness center. 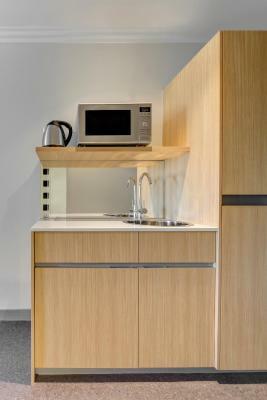 All air-conditioned rooms have a kitchenette with a microwave and refrigerator. The rooms also include a LCD TV with selected satellite channels. 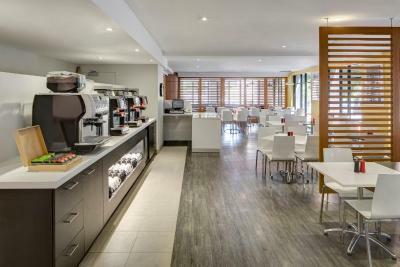 Sydney Travelodge offers a restaurant that serves a varied hot and cold breakfast buffet each morning. 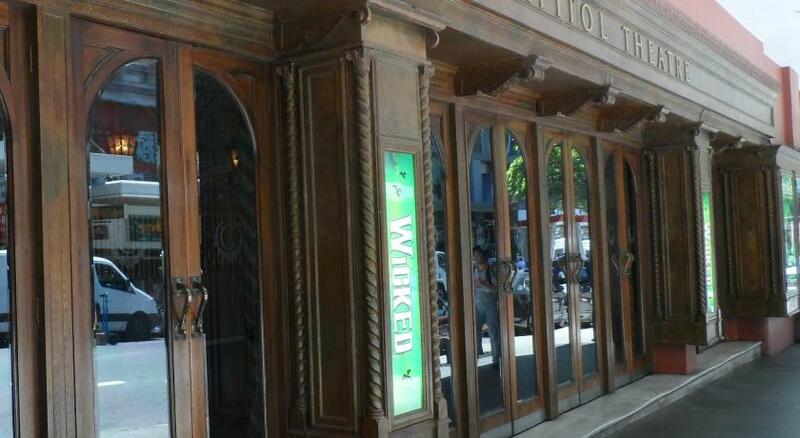 There are a number of restaurants, cafés and bars within a 3-minute walk. 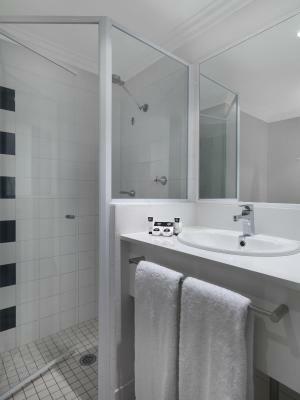 There is a guest laundry and dry cleaning and luggage storage are available upon request. A safety deposit box is available at the 24-hour front desk. Offsite parking with single entrance is located 650 feet away. 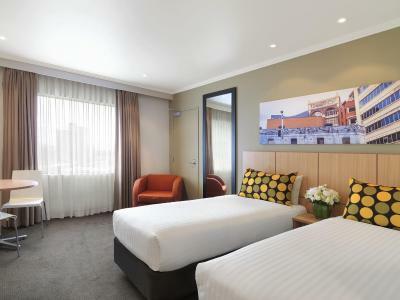 Sydney Travelodge is located in Sydney CBD (Central Business District), just 5 minutes’ walk from Museum Train Station. Darling Harbor is 1.2 mi away and Chinatown is a 10-minute walk. 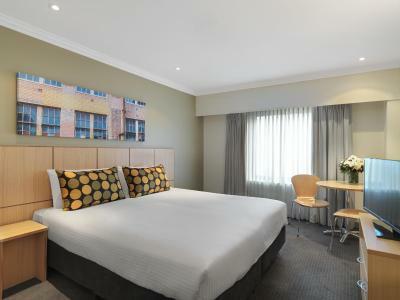 When would you like to stay at Travelodge Hotel Sydney? 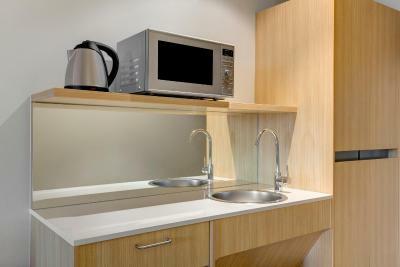 Refurbished room featuring a kitchenette with microwave, small refrigerator and tea/coffee making facilities. Please note that the price is based on 3 guests. The maximum occupancy is 3 (see Hotel Policies). 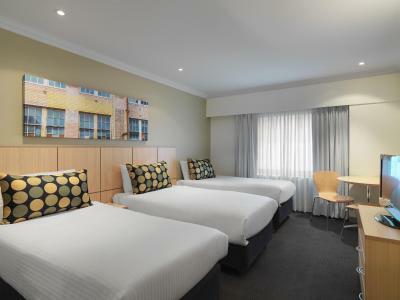 This twin room has a microwave, air conditioning and seating area. 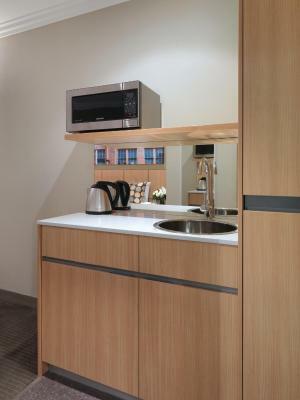 This twin/double room features a mini-bar, seating area and microwave. 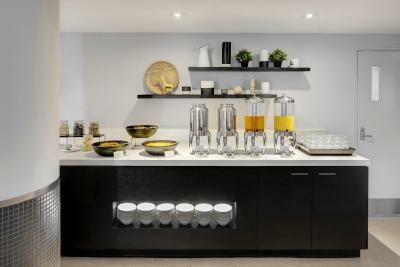 Refreshingly Simple It’s a hotel that’s designed just the way you really like it, with a down to earth attitude and an honest sense of humour. 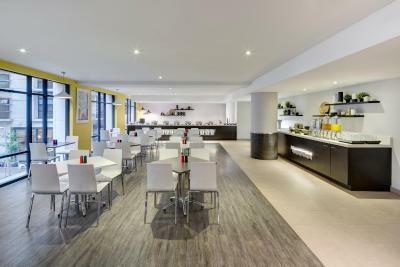 A conveniently located hotel that is created for the way we live today, without all the unnecessary extras, but with all the parts that make it a comfortable and practical place to stay, from the hearty new breakfast offering, to the standard 11am check-out time, and the comfortable beds, kitchenettes and reliable showers. There are currently 17 hotels across Australia and New Zealand, soon to be 18 with the opening of Travelodge Sydney Airport in 2016. 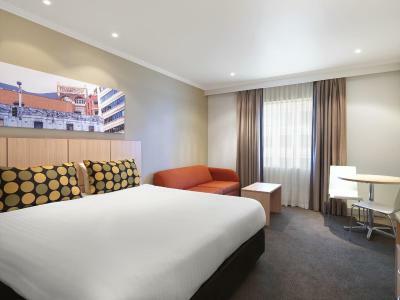 House Rules Travelodge Hotel Sydney takes special requests – add in the next step! A AUD50 damage deposit is required on arrival (around USD35.06). This deposit will be fully refunded 14 days after check-out, as long as there isn't any damage to the property. 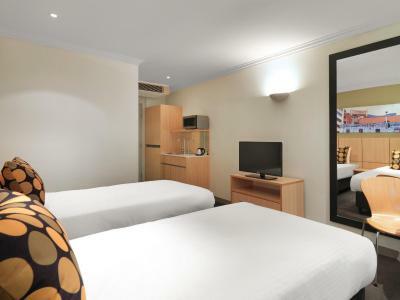 Travelodge Hotel Sydney accepts these cards and reserves the right to temporarily hold an amount prior to arrival. 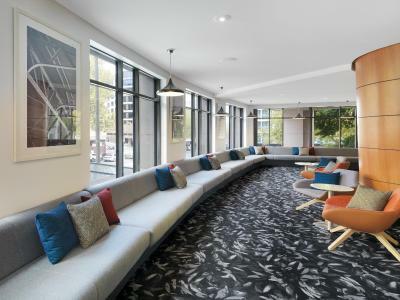 Please note the lobby at Travelodge Hotel Sydney is currently being upgraded and is expected to be completed by mid-April 2019. During this time, the property suggests that guests allow extra time in case of delays during the check in and check out process. 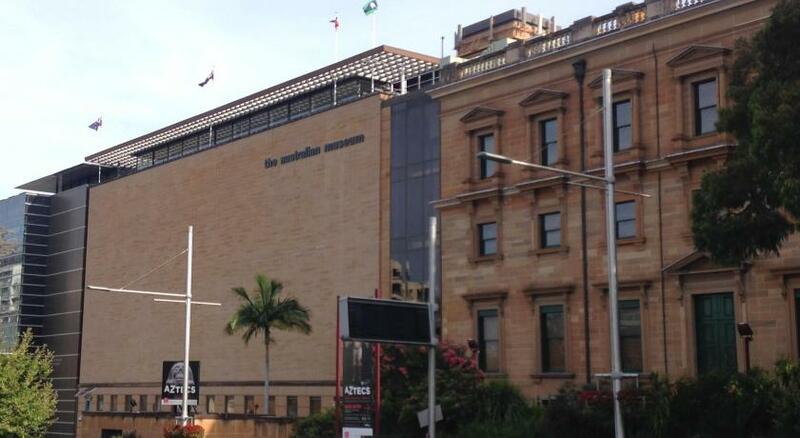 Please also note that currently there are maintenance works taking place on the exterior of the building. Works will take place between 09:00 to 17:00, Monday to Friday and guests may experience minor noise disturbances. This is expected to be completed at the end of August, 2019. Please note that guests are required to present a valid photo ID upon check in. Please note that a 1.2% surcharge applies for payments made with Visa Card, MasterCard, American Express and China Union Pay. Please note that a 2.5% surcharge applies for payments made with Diners Card and JCB. Please note guests receive 5 MB of free WiFi per room, per 24 hours and for up to 5 devices per room. Additional data is available for AUD 9.95 for the remainder of the 24 hours, for up to 5 devices per room. Please note that offsite parking is available for a surcharge but is subject to availability. A damage deposit of AUD 50 is required on arrival. That's about 35.06USD. This will be collected by credit card. You should be reimbursed within 14 days of check-out. Your deposit will be refunded in full by credit card, subject to an inspection of the property. Customer service. Upon checking I asked for the manager Kevin to speak with his team member offline rather than in front of me and his other team members when giving ‘constructive’ feedback to another team member about his ‘bad reputation’. Beds a little too soft. Room was clean and spacious , room service good ! 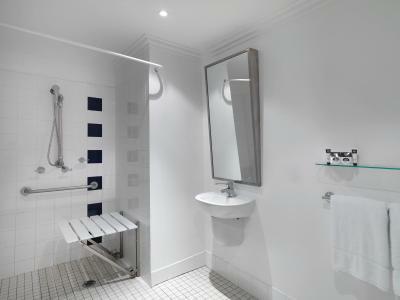 The room was spacious for a budget hotel, there was even small dining table and dishwashing sink! New towels were left even though we hung up our towels for reuse. My daughter had a cold and finished tissues. Could not get through to reception either on inside line or external line and gave up after about 10 tries, if not more. Left empty tissue box on bed to show needed new tissues and when we came back, bed was made and empty container was put on the shelf so I had to call reception. The following day we were left with about 5 sheets of toilet paper in the bathroom after the room had been attended to. Again had to call reception which took about 6 attempts before I got through to anyone. We had people for the last 2 nights that decided it was a great idea at midnight to start shouting at each other when they got to the room and bang around in the bathroom for the next half hour to an hour. luckily I had ear plugs to drown out the noise. The people that attended to the room on the first morning did a good job and Sylvia at reception on check in was efficient and accommodating. Shower door didn't close properly and wet the entire bathroom, which was small. Having said that it's all you need, a shower and a toilet. The room is basic and is all you need if you just want a clean place to sleep. It's a central and convenient location. And for Sydney accommodation prices, it's fair to say it's reasonable. The hotel is very run down. Very old. Bathrooms feel 20 years old. Didn't make up our room one of thr days. Possibly just missed it. Bed was very comfortable. Quite a good view but window was absolutely filthy. Location excellent. Room service great.